UPDATED: Mon., Jan. 29, 2018, 8:21 a.m.
IDAHO FALLS, Idaho – There is little question that the focal point of most rock ’n’ roll bands – aside from the lead singer – is the lead guitarist. But where do rock gods turn when they need professional help repairing and updating the tools of their craft? Some turn to Idaho Falls resident Eric Daw. For the last 25 years, Daw has made a name for himself in the industry, repairing and building custom guitars for musicians big and small. Artists such as Billy Gibbons of ZZ Top, k.d. lang, the Black Crowes, and Jimmie Vaughan have sought out Daw’s expertise when touring through the Pacific Northwest. But the Idaho Falls native always wanted to return home while continuing to follow his passion. After 15 years working out of a guitar shop in Seattle, Daw returned to Idaho Falls seven months ago with his wife, Melissa, and two kids. He’s working as his own boss in the trade he loves. What resulted in his move is Eric Daw Guitars. Operating out of a shop behind his house, Daw works on guitars sent to him from across the country. Through his guitar-centric podcast “The Fret Files,” Daw estimates that a third of his work comes from listeners across the country, with the other two-thirds coming from local residents and his contacts from Seattle. The podcast’s impact on his business surprised Daw. 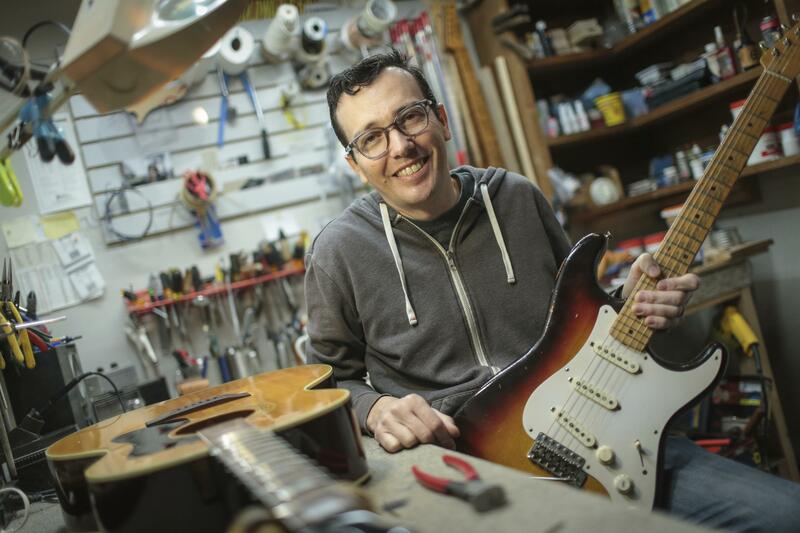 The podcast was a simple start for Daw, but the connections he made throughout the guitar community in Seattle helped convince him that a move back to Idaho Falls could be manageable. Daw started the podcast out of a love for talk radio. From there, the interest continued to skyrocket. Since then, Daw has expanded his podcast to a bi-weekly venture. With his wife as co-host, Daw discusses the intricacies of different guitar-related topics and repairs on any given week, and answers questions from listeners. Daw estimates that he receives 10 to 12 questions for every show. The Idaho Falls community has also helped Daw succeed in his new venture. Idaho Falls guitar enthusiast Craig Green was one of many customers that were “over the moon” when Daw returned to the region. “It was pretty much the greatest day of my year when he came back to town,” he said. Green met Daw before his move to Seattle, and their relationship continued through a mutual love of guitars. “He just has a really good intuition on how something should sound and play,” Green said. Mike Doggett also recognized Daw’s passion for guitar mechanics before he even took off to Seattle. As the owner of Mike’s Music in Idaho Falls, Doggett has seen a fair share of music aficionados walk through his doors. But the passion Daw expressed was different. Since Daw moved back, Doggett has referred difficult repair jobs to him. Along with guitar repair, Daw also engineers custom-made guitars based off of popular brands from the past. In what he refers to as Pin-up Custom Guitars, Daw works to recreate classic guitars such as the original Gibson Les Paul, helping collectors get their hands on a piece of music history without paying the exorbitant price. Daw’s custom guitars range from $2,200 to $2,500. So far he has produced 113 custom guitars for clients across the country. Daw handcrafts each guitar to the specific requests of each customer. With experience working on those classic guitars, Daw has been able to recreate the look, feel, and sound of those historic instruments. All of this is done from his backyard, and Daw would not have it any other way. Published: Jan. 28, 2018, 11:11 a.m. Updated: Jan. 29, 2018, 8:21 a.m.